Summer months bring with them the urge to go outside and enjoy a warm twilight under the stars. Unfortunately for many people mosquitoes can ruin these lovely evenings. Mosquito control is an important necessity for everyone due to the possible diseases they can carry and marks they leave on skin. Philadelphia mosquito exterminators can get rid of mosquito infestations quickly and easily, but here are some tips to remove mosquitoes before they become a problem or while waiting for the exterminator. Mosquitoes don’t usually travel too far for a meal. This means that the mosquitoes attacking a person are likely coming from a nearby source. The pests use standing water for breeding purposes so any water around a home can produce thousands of mosquitoes. Getting rid of standing water is the most critical step in mosquito control. If mosquitoes have become bad in an area the owner should check low spots on their property, rain gutters, outdoor faucets and anything else that may hold water. These stagnant water sources will continue to produce these pests until they are emptied. 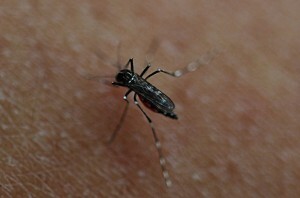 The appearance of a person’s yard can also attract mosquitoes. Shrubs, bushes, trees and low lying vegetation provide great safe havens for the insects. When this vegetation is kept properly trimmed mosquitoes have a less habitable environment. This simple step allows more sun and wind exposure to the property which will usually make mosquitoes look for a more habitable area to roost in. Prevention is one of the best tips to remove mosquitoes. Many people believe that any type of lighting will attract mosquitoes. Luckily this is not the case. Only certain frequencies of light are attractive to pests so as long as those frequencies are avoided a yard should be fine. Lights located anywhere outside should have sodium lamps, yellow bug lights or LED lights. This type of lighting does not attract mosquitoes so any distant cousins of the pests that are already in a yard will not easily find their way to a reunion. For years there have been people who swear by citronella candle use to rid themselves of mosquitoes. Unfortunately for many people who have already spent extra money on these candles they may not be as effective as initially thought. It turns out the main reason citronella candles and torches ward off mosquitoes is that they produce moisture, heat and carbon dioxide. It turns out that every candle does that. So even though citronella candles will help get rid of mosquitoes other candles will do the same job for less. Some mosquitoes are just going to ignore the valiant efforts some home owners put into getting rid of them. This being the case, whenever a person goes outside they should wear long sleeved shirts and pants. Even the strongest mosquito in the bunch cannot get through denim. This of course leaves a person’s face and neck exposed. Spraying mosquito repellent on these areas is the quickest way to make sure a person’s head doesn’t become a feast. 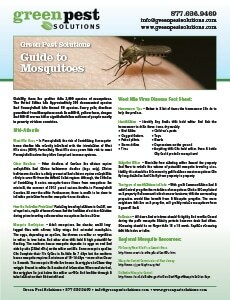 Mosquitoes can become the bane of anyone’s existence during a warm summer night. These pests can spread disease and make it unbearable to sit outside under the stars. At home remedies work well to ward off some mosquitoes, but these methods will not completely rid a yard of the parasites. Green Pest Solutions is a recognized leader in the pest management industry in the Philadelphia and the surrounding areas. We offer the best in pest and termite control services using traditional treatment methods and green products.